Have a look at this image… Anyone want to try and replicate or do something similar? This builds on the tower definition we assembled together. There is nothing new here that we haven't gone over in class…… look closely at the JPEG…. I will post my file when there are a few attempts or responses. I tried doing a high-rise using the trial and error method and without referring to any tutorial. Though I was able to execute a big portion of my idea, I wasn't able to connect the outer skin's points diagonally in a vertical direction. Any ideas on how to connect those points together ? In order to get a diagrid-like structure out of your set-up, you will need to organize your points into two separate lists. One list will stay how you have it… the other list shifts the points up one floor. When you connect the two lists with a line component GH will draw vertical lines…. then you can shift the points of one of the lists to get diagonals. Have a look and see if that gets you where you want to go…. Thanks Nate. I got the idea of shifting the points first. However, is this the only way to do it or there is another way to connect them directly without shifting them? Could listing the points and connecting them be another approach? I built off your tower definition to get a diagrid piping on the exterior skin. I applied some of the space-truss definition structure where you previously left off. You can see some images and get the amended definition at my page. I really liked the flexibility in your definition to apply any polygon for the floor plate. The next element I would like to explore is using a graph mapper to exponentionally "decay" or reduce the floor plate square footage as the tower gets higher. 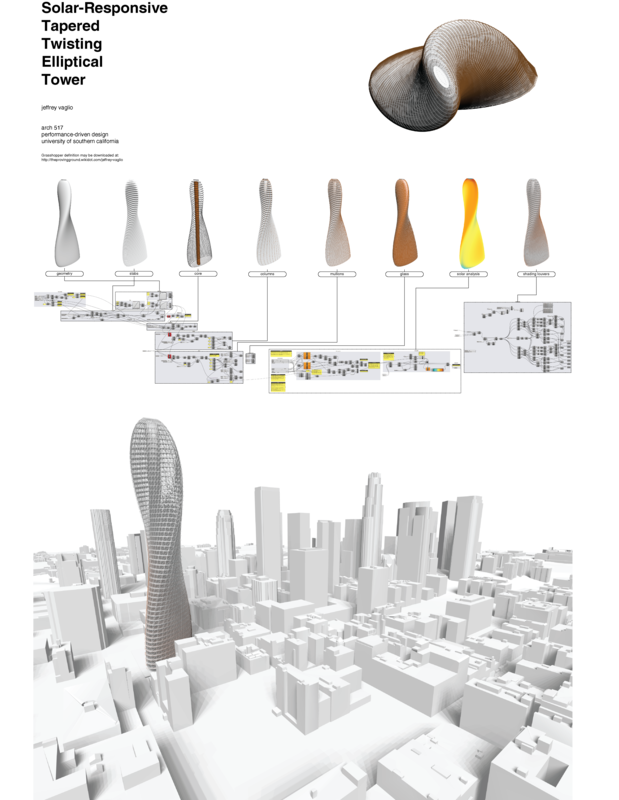 This could result in a tapered form similar to many of the ovoids out there such as Foster's 30 St Mary Axe project. I like the idea of diagrid piping. I will continue working on my tower with this grid instead of the cross one. My next step that I had in mind is the same as your, which is to taper the tower as it goes up using a graph mapper. I will work on that as a next step and most probably I will continue working on the same tower for the rest of the topics. I have been working on linking several interesting Grasshopper routines to achieve interesting parametric towers. Check out my page. 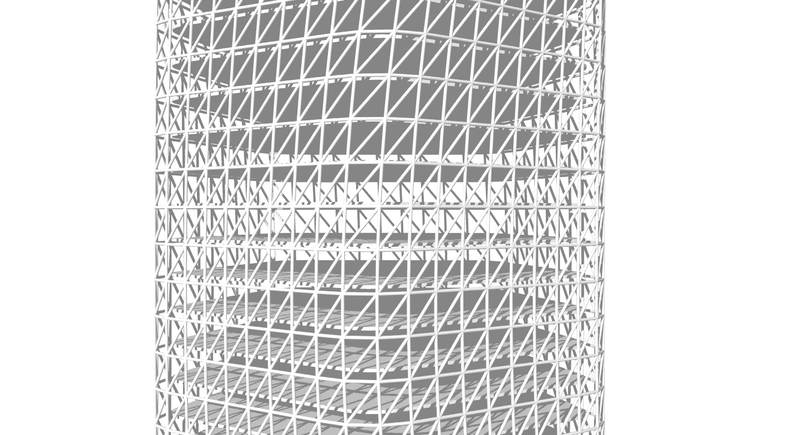 One is a parametric tower Grasshopper routine which twists and tapers an ellipse as it rises vertically. Core, structure and glazing systems are applied. A louvered shading system (via nGai's insolar louver system is layered on the facade exterior in response to an annual solar analysis on the controlling geometry mesh. The ellipse could easily be swapped out for another polygon within the slabs group of the Grasshopper routine. Feel free to extract or modify components to help develop your tower vignettes. Cool study! The close-up view on your page showing the systems is quite nice. Thanks Nate. Below are vignettes and additional views may be seen at my page. With all the things going on in my file, I'm having some trouble keeping things organized in linking things from the beginning of my process to something a few steps down. Any tips on how to streamline this a bit more and not have wires running all the way across my file? try using the "Receiver" component under Params to store information. The receiver will link to data with an "invisible" wire. It will show connections when you click on it. You can then move it to the other end of the definition and input it into the component you need. It is a good way to avoid clutter. Can you have a look on my files that I just uploaded? I have been working on this tower for the past whole week. However, I still have problems. I couldn't get the floor slabs to follow the vector force. Another issue that I'm having is that I couldn't add the solar system to my file. It's too heavy and whenever I add it, the file crashes. I was having a lot of issues with crashing too. The file with the paneling system got too large for my system to handle. I ended up having to remove a level of detail from the individual panels to get the thing loaded.